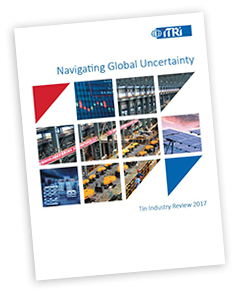 This is the fifth edition of a series of major studies on the tin outlook published by International Tin since 2008. All of the key questions which will determine the outlook for the industry are considered in depth and answered objectively. Will substitution and economisation continue to impact tin demand or can new applications more than offset these negative factors? Will mine supply from the established big producing countries, China,Myanmar and Indonesia, be maintained or decline? While some big companies are investing heavily, can juniors with new projects obtain financing to get them off the ground? Will recycling play an increasing role in balancing supply and demand? Are known stocks of tin sufficient to cover expected supply deficits in the coming years? How does the cost of mining define the likely tin price range in the next five years and beyond?